I made a little kitchen mistake the other day. Mein Frau and I were making a salad. My “job” was just to make carrot shavings with my new, fancy vegetable peeler. That is today’s Object at Hand. I tried it on the top and the side of the carrot. But what worked best was using it below the carrot, so the peels dropped neatly into the bowl. But then I looked away for a second, probably to say something. I don’t really remember. Sudden, sharp pain on the tip of my thumb! I pulled it away, and watched the newly corrugated corner of my thumb gloss over in red. I grabbed a tissue to staunch, and quickly left the room. You see, spousal is squeamish. I got a band-aid and applied it, and then returned to look for the missing piece of thumb. Just a chip of skin, mind you, shy of a centimeter across, and maybe 3mm thick at the center. I found said remainder, and noted with my usual childish wonder, how the straight furrows on one side contrasted with the swirls on the other. But my band-aid floweth over. And I considered that I had a reasonably well fitted patch for my now bare and exposed inner dermis. So I peeled off the soggy bandage, and slapped the chip over the divot. I tried to align the grooves, but I was hurrying, and reasonably confident that I would not get the orphaned structure to reunite. So quick trumped accurate. Oddly, it started hurting less as soon as the skin covered the raw area. A fingertip band-aid (our last on hand) covered it and held it in place. The next day, I had to consider how to bathe. We had no large finger-cots, nor convenient disposable gloves on had. So what did I find to put on my had? One of the 2×4″ bags that I use to hold some of the small items that MrTitanium sells. After bathing, I took an “after” picture to show the crudely stuck-on bit of skin now protecting the sensitive area. I figure that it will probably come off in a few days, as new skin comes in from below. Today’s object is one I compulsively make and leave behind in restaurants. I fold those paper napkin wrappers into these square paper springs out of old habit. I learned how to fold these from construction paper in third or fourth grade, as a device to make greeting cards more dimensional, to elevate a cut-out shape above the field. But it became a fidget-habit when I started working in the real world. We had dot matrix computer printers back then. They were noisy, and the folded continuous paper had to be fed from a box using perforations designed to fit tractor cogs on the printer, usually on micro-perforated separable strips. So after printing what had to be printed, we would remove that side strip with the holes. I am a fidgetor. My hands are rarely at rest when my mind is moving. So given this bounty of paper strips, I would fold them into long paper springs and leave them everywhere. I remember one meeting in the start-up robotics company for which I was working in the 1980’s. One of the members brought in her little girl. The wean picked up one of my foot-long springs and was happily playing with it. This was memorable to me as the first time I’d seen anyone but myself derive pleasure from my little compulsion. The mother told her that she should put “that man’s” paper down. I assured them that I was happy to let her have that one. Three decades later, when these tractor feed strips are rare, I find myself folding napkin wrappers into these springs, and now admitting my bad habit. I secretly hope that some server or bus-person notices the odd nature of this minimalist origami as art, rather than just another piece of trash. But I am not holding my breath. 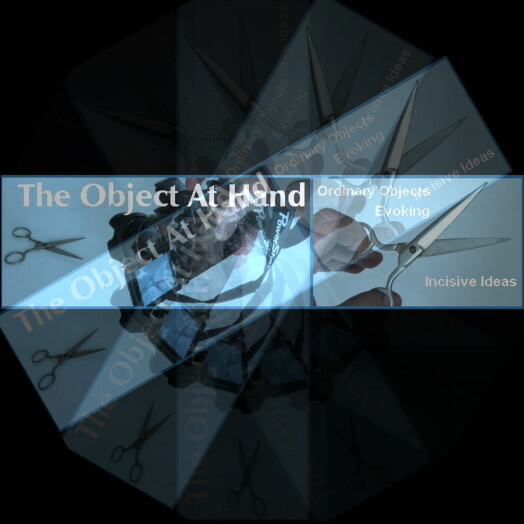 The Object at Hand is a new blog that began with the idea of writing stories or observations inspired by some object that I have readily to hand. For this silly intro, I submit a spin on the initial page banner. One may argue that a digital image is not an object. However, it is clearly an artifact. A future post will explain the scissors. Meanwhile, I hope that someone will find my musings amusing, thought provoking, and/or of interest.